WELCOME TO VIRTUAL GOLF SYSTEMS – NORTHWEST BASED PROVIDERS OF THE WORLD’S MOST ADVANCED INDOOR GOLF TECHNOLOGY. HD Golf’s™ revolutionary image processing software combines high resolution digital images and satellite data into a 3D model of a golf course to produce a totally realistic indoor golf experience. Golf courses not only look real, they are completely accurate everywhere on the course – every tree, bunker, and hazard is faithfully reproduced exactly as you would see it when playing the actual golf course. High Definition Golf™ - It looks and plays like the real thing! Geophysical Information Systems (GIS) based, using high resolution satellite photos, accurate terrain and elevation data provides totally realistic course play. HDTV compatible display delivers exceptional quality high brightness, high contrast images. DVI (Digital Video Interface) ensures the highest video quality. Choice of a home and commercial HDTV compatible projector. High brightness/contrast multi-layer screen is extremely durable, ball mark resistant, and controls ball rebound perfectly. I WANT A DEMO! PLEASE CONTACT ME. The only thing more real is the course itself. Other golf simulators can’t match the unprecedented feeling of being there and the accuracy of High Definition Golf™. That’s because no other golf simulator incorporates our revolutionary, proprietary software and computer vision technology. By combining high-resolution imagery with geophysical and satellite data, the result is a high-definition 3D photo realistic reproduction that is so crystal clear and faithfully reproduced, you’ll swear that you’re standing on the actual golf course. The industry’s most advanced tracking technology measures all critical club and ball data precisely, creating a true reproduction of your ball’s flight. And the wonder of sound completes your experience, whether it’s the roar of the gallery saluting a perfect shot or the agony of an errant tee shot splashing down into a watery grave. UNCOMPROMISING COMMITMENT TO PERFORMANCE, RELIABILITY & SERVICE. At High Definition Golf™ we are committed to providing you with the most realistic indoor golf experience in the world. That commitment to quality engineering and components is the reason why our golf simulators are known for being extremely reliable and virtually maintenance-free. We incorporate only high quality components including professional-grade computers and the highest-quality, non-marking, ultra-quiet screen. We build the entire system in-house. We test each and every element before the golf simulator is shipped for installation. As a result, we possess an intimate knowledge and understanding of every single part of a High Definition Golf™ simulator. We know it inside and out. We know how well it’s designed. We know how well it’s put together. And we know how superbly it works. In fact we are so confident in our product’s ability to deliver, that we stand behind our hardware and software with the industry’s best warranty. We are equally committed to redefining the customer experience. From your initial inquiry right through the lifetime of your ownership, whether you require sales, service or engineering, you can expect a level of responsive and personal service that will far exceed your expectations. HD GOLF™ CONTINUES TO REDEFINE THE STANDARD IN GOLF SIMULATION. Designed and manufactured by Interactive Sports Technologies Inc. (IST), High Definition Golf™ is widely recognized as the technological leader in the golf simulator industry. In fact, the measurement, accuracy and realism of High Definition Golf™ simulators are unparalleled by any other golf simulator currently on the market. All High Definition Golf™ simulators include the most thorough and precise club and ball tracking system, utilizing proprietary IST High Speed Spectrum Sensor technology™. The golf simulator captures supremely accurate measurements of all critical club motion and ball launch data and displays the resulting ball flight in high definition. Luxury home owners, condominium developers, 5-star hotels and resorts, cruise lines, indoor golf centers, fitness facilities and sports bars praise the awe-inspiring scenery and simplicity of operation. Respected industry professionals at private and public courses, golf academies, coaches at colleges and universities affirm -- HDG™ is an incredible choice for teaching, commercial, retail and residential use. Give us a call to discuss your space and we can help you select the best model for you. Our new product called HD Multi-Sport™ which is available to customers with a High Definition Golf™ simulator. It adds game simulations for soccer, baseball, football, hockey, dodge ball, shooting, and lacrosse. 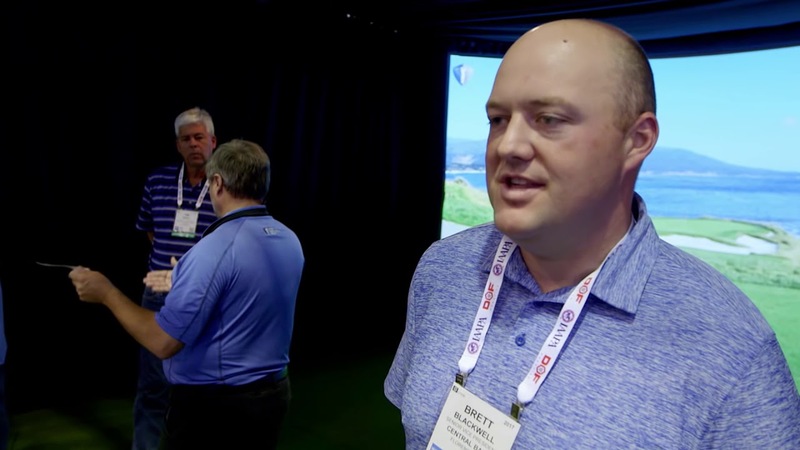 Virtual Golf Systems has installed HD Golf™ technology for world famous touring and teaching professionals such as: Steve Stricker, Jerry Kelly, Bryson DeChambeau, and Jim McLean.